I love fall foods. They’re delicious and comfoting. Yesterday I had had enough of the heat (it’s been in the high 80’s and 90’s for the last couple months), and decided I was not going to wait for Mother Nature to calm down to start my Fall. 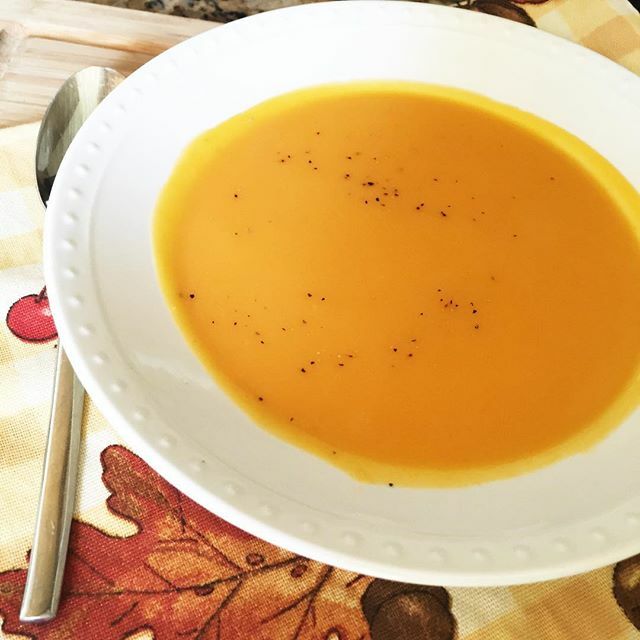 Butternut Squash soup is easy, delicious, and perfect for an Autumn dinner. Place the squash, onion, and chicken broth into a crockpot. Cook on High 3-4 hours, until squash is very soft. Pour the squash mixture into the blender and blend until smooth. You may need to do this in sections a few cups at a time. Continue to cook for 30-45 minutes. Place the squash, onion, and chicken broth into a crockpot. Cook on High 3-4 hours, until squash is very soft. Return the blended squash mixture back to the crock pot and set to low. I am totally going to buy butternut squash when I'm at Costco today and make this! I need good simple things to get more use out of my crockpot. Thanks! How many does this serve and can you substitute milk for the coconut milk? Thanks! You mention sweet potato in the ingredient list but you do not say anything about it in the directions. I assume you cook it with the squash. Can you please clarify and fixed the website Recipe. Thank you! Oh yes! The sweet potato and the squash get chopped up and placed in the pot together.